On this day in 1890, the US Army murdered as many as 300 Native American men, women, and children. As dawn appeared on December 29, 1890, about 350 Lakota Indians awoke, having been forced by the US Army to camp the night before alongside the Wounded Knee Creek in South Dakota. The US Cavalry’s 7th Regiment had “escorted” them there the day prior and, now, surrounded the Indians with the intent to arrest Chief Big Foot (also called Spotted Elk) and disarm the warriors. When a disagreement erupted, army soldiers opened fire, including with Hotchkiss machine guns. Within minutes, hundreds of children, men, and women were shot down. Perhaps as many as three hundred killed and scores wounded that morning. Few Americans now know that the deadliest shootings in US history were massacres of native peoples. Today is the anniversary of the largest such massacre. The event’s common name, “The Battle of Wounded Knee,” obscures the true horrors of that day. For this was no “battle” — it was a massacre. Indigenous peoples were the first to experience the wrath of European conquerors. While no one knows how many people lived in what is now the United States, estimates range from two to eight million before contact. By 1900, about two hundred thousand remained, nearly all consigned to remote wastelands in the interior west that elites considered worthless. The Lakota, comprised of seven bands, was the largest and most powerful of a larger group of Indians who lived in the northern Plains that together are called Sioux. For most of the nineteenth century, they fiercely resisted the encroachment of US authority and people on their homeland. Few US citizens or European immigrants lived in the vast interior until after the Civil War. Then, thanks largely to the US government, millions streamed westward aboard government-financed transcontinental railroad lines. The immense lands — seized from Indian nations — and abundant natural resources drew white people wanting to farm, ranch, and mine. They hoped to live independent lives and, just maybe, get rich. The US government also dispatched the Army to protect “settlers” from increasingly angry Indians. The government and citizenry considered the lands that Indians had lived upon for millennia to be the property of the United States. Accordingly, natives were killed, displaced, or forced onto “reservations.” The US compelled Indian nations to sign treaties, sacrificing their traditional lands for other, far-smaller parcels often far from home. Generally, these “negotiations” were of the “or else” variety — as in: sign the treaty or be killed. Plains Indians also were promised some money and food rations to replace their buffalo hunting and semi-nomadic lifestyles, which their entire culture was based upon. After the Civil War, dozens of Indian nations found themselves trapped between destructive government policies and ongoing settler invasion. Not surprisingly, many Indians resisted. So throughout the 1860s, 1870s, and 1880s, the United States engaged in dozens of wars against the Arapaho, Kiowa, Comanche, Nez Perce, Bannock, Apache, Ute, Blackfoot, Navajo, and others. The most well-known such war took place between the United States and Lakota Sioux (with Northern Cheyenne and Arapaho allies) in the Dakota, Montana, and Wyoming territories. In 1868, the Treaty of Fort Laramie had ended the Powder River War and set aside a “Great Sioux Reservation in perpetuity.” However, many Sioux bands had not signed including Chief Sitting Bull’s Hunkpapa Sioux, Chief Red Cloud’s Oglala, and Spotted Tail’s Brulé. In response to settler incursions and to defend their homeland and lifestyle, the Sioux raided white settlements, intimidated federal agents, and harassed miners, settlers, and railroads. It is inconsistent with our civilization and with common sense to allow the Indian to roam over a country as fine as that around the Black Hills, preventing its development in order that he may shoot game and scalp his neighbors. That can never be. This region must be taken from the Indian. Treaties be damned, the Army demanded that all Indians report to reservations by January 31, 1876, or be hunted down. When most refused, the Army dispatched troops to the Little Bighorn River basin in south central Montana. Shortly thereafter, Custer underestimated his Sioux and Cheyenne enemy, divided his too-few troops, and attacked a huge encampment of several thousand warriors. Famously, his troops were surrounded and obliterated at “Custer’s Last Stand,” which was really more a roving battle. Stunned by this defeat, the Army redoubled its efforts to defeat the Lakota, committing thousands more troops to this war. One by one, bands of Indians were forced to surrender and confined to reservations. Sitting Bull, cleverly, relocated with his people to Canada, in 1877, where the US Army could not follow. Meanwhile, the Black Hills became the nation’s most profitable gold-mining region, producing enormous wealth for white miners — including a man named George Hearst, who became one of the nation’s richest men. His son, William Randolph, turned that fortune into the nation’s most powerful newspaper empire. The Sioux ended up in Pine Ridge and four other reservations scattered across South Dakota, North Dakota, and Nebraska. Treaties be damned, in the late 1880s the government reduced Sioux meat rations while many of their cattle died from disease. The Sioux became increasingly desperate: their lands taken, the bison — at one time numbering in the many millions — perhaps down to a few thousand, their entire way of life decimated. And, now, they were starving. Many remaining Plains Indians, including Sioux, sought solace and answers in religion. Wovoka, a prophet of the Great Basin (Paiute) Indians, promised the Sioux they would return to prominence and white people would be wiped out, if they embraced the Ghost Dance — not unlike visions that Christians might experience with fasting and solitude. As the Ghost Dance spread like wildfire, Army officials worried that this religious revival could lead to a Sioux uprising. To squash this possibility, the Army ordered the arrest of Sitting Bull, a rallying point of the Ghost Dance, where he lived on the Standing Rock Reservation. (Of course, this place and people recently became famous due to the heroic stand of Standing Rock Sioux in resisting the Dakota Access Pipeline from crossing some of their sacred lands and endangering their water supplies.) But Sitting Bull refused to go quietly, resisted arrest, so was shot and killed. With Sitting Bull eliminated, the Army next sought out Big Foot and his followers, who soon headed to the Pine Ridge Reservation, where they hoped they might be safe alongside Red Cloud’s band. On December 28, 1890, soldiers in the 7th Cavalry, the same unit that had suffered ignominious defeat with Custer, intercepted 350 Indians near Pine Ridge. The Army rounded up the starving and freezing natives, with Chief Big Foot suffering from pneumonia, and had them make camp at Wounded Knee. US soldiers, numbering perhaps five hundred, commenced disarming the Indians the next morning. One can imagine the tension, the Ghost Dance having sparked a renewed sense of pride and empowerment among the defeated Sioux. The Army was tasked with keeping the Sioux pacified and confined to reservations. Sitting Bull had been killed two weeks prior; now, the Army sought to arrest and disarm another band of Sioux warriors. Black Coyote, however, resisted giving up his gun — perhaps because he was deaf and could not understand English. In the scuffle that ensued, a shot rang out. Instantly, US soldiers opened fire with their weapons including the four Hotchkiss machine guns. Among the most powerful weapons of the era, the Army had used these against Indians previously. Not only did the machine gunners target warriors scrambling for what weapons they could find, they also raked teepees full of children and women. Those running towards a nearby ravine also were cut down. Though the Indians mostly had been disarmed, some still possessed weapons or grabbed some from those already confiscated. While the machine guns mowed down the defenseless, people scattered in every direction. Soldiers, no longer following orders or discipline, chased down and killed any Indian, armed or not. Army general Nelson Miles visited this killing field a few days later. He expressed shock that women with babies in their arms had been shot down, several miles from the initial “battle” site, indicating that soldiers systematically hunted down all who fled. Dee Brown, author of the popular history Bury My Heart at Wounded Knee, places the number of Indians killed at about three hundred, including at least a hundred children and women as well as Big Foot. They were buried in mass graves. Twenty-five US soldiers died, too, many quite possibly from friendly fire. I did not know then how much was ended. When I look back now from this high hill of my old age, I can still see the butchered women and children lying heaped and scattered all along the crooked gulch as plain as when I saw them with eyes young. And I can see that something else died there in the bloody mud, and was buried in the blizzard. A people’s dream died there. It was a beautiful dream . . . the nation’s hoop is broken and scattered. There is no center any longer, and the sacred tree is dead. Wounded Knee is commonly described as the last “battle” in the US-Indian Wars. It could be seen as the deadliest mass shooting in US history. It certainly wasn’t the only one. In 1870, the US Army accidentally killed the “wrong” group of Indians, in the Baker or Marias Massacre. In north-central Montana, along the Marias River, Major Eugene Baker ordered his soldiers to attack a village of peaceful Blackfeet. 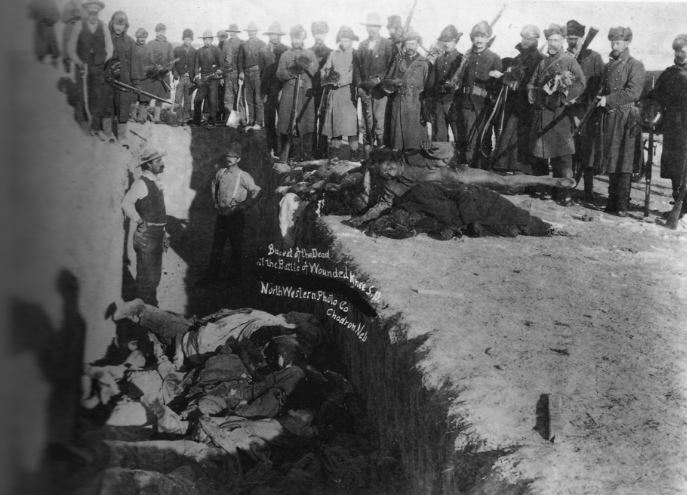 When informed by a subordinate that this group was not the one the troops were looking for, Baker responded, “That makes no difference, one band or another of them; they are all Piegans [Blackfeet] and we will attack them.” About 175 unarmed Blackfeet were murdered, the great majority children and women. Countless killings of smaller numbers of Indians happened throughout US history, including an untold number due to the 1755 bounty put on the “heads” of Wabanaki Indians in Maine and the slaughter of twenty Conestoga Indians by the “Paxton Boys” in 1763 in Pennsylvania. These and other mass Indian killings remain unknown by the great majority of Americans. Wounded Knee (and Bear River, Sand Creek, and Marias) simply do not exist in the collective memory of non-natives. Native lives still do not fit into the larger narrative of US history. Of course, Indians have not forgotten. In 1973, two hundred members of the American Indian Movement (AIM), a militant civil rights organization partially styled after the Black Panthers, returned to Wounded Knee to demand the federal government live up to nineteenth-century treaty obligations. Quickly surrounded by police and federal agents, AIM supporters engaged in a seventy-one-day standoff that left two natives dead and one federal agent paralyzed, the so-called Second Battle of Wounded Knee. Two years later, another clash between AIM and federal law enforcement on the Pine Ridge Reservation left two FBI agents dead and Leonard Peltier found guilty of first-degree murder, though he always has maintained his innocence. Currently, his supporters including Amnesty International, which claims his trial was unfair, hope for clemency from President Obama during his final days in office. In recent years members of the Northern Arapaho of Wyoming and Northern Cheyenne of Montana, along with Southern Arapaho and Cheyenne tribes of Oklahoma and their allies, commemorate the Sand Creek Massacre with a four-day march. They walk or run nearly two hundred miles, from the location of the killings, now a National Historic Site, to the state capitol building in Denver. Unfortunately, many Americans do not know of Wounded Knee and other indigenous massacres. The tragic shooting in Orlando earlier this year highlights this invisibility when that tragedy, which left forty-nine dead, repeatedly was labeled the “worst shooting in US history.” In fact, as Roxanne Dunbar-Ortiz reminds us, Native Americans have not disappeared even if their role in US history is forgotten. During the past few months, the inspired and inspiring actions of the Standing Rock Sioux have compelled all Americans to acknowledge Indian existence and resistance. They also demonstrate what an indigenous-led, multiethnic social movement can look like. Sitting Bull would be proud of these water defenders, his descendants. Past and present, the Sioux and other American Indians have charted a path of defiance and independence despite genocidal efforts by European conquerors and American settlers. Today, we remember a particularly brutal chapter in the violent effort to wipe out America’s first peoples. Peter Cole is a professor of history at Western Illinois University. He is the author of Wobblies on the Waterfront, and writing a new book, Dockworker Power: Race, Technology, and Unions in Durban and the San Francisco Bay Area.